Setting up your taxes is a simple and fast process. Magnet Commerce allows you to create your own custom options according to your area's tax rules. It is possible to set general rules for the countries you are shipping products to as well as more specific ones referring to certain areas or states of a country. Figure: Setup your Tax Options by choosing "Setup > Taxes" in the Administration Panel. Editing the Tax Options menu. Figure: Adding Tax rules in the Tax Options menu. The form is split into 3 categories, one for adding tax rules per Country, another for adding rules per State (which applies to Canada, Greece, the United Kingdom and the United States) and a third one for adding rules using Zip codes (which only applies to the US). If you wish to add tax on your products depending on the country you are shipping to, use the "Add a Country Tax" form. Simply use the drop down menu in the "Countries" field to choose the country you want to set tax for and then define the tax amount in the "Tax Rate" box. If you also wish to add tax on the shipping cost tick the "Tax Shipping" box. Finally click on the "Add" button to save the current rule. Remember there is always the option of deleting a rule by use of the "Delete" button. 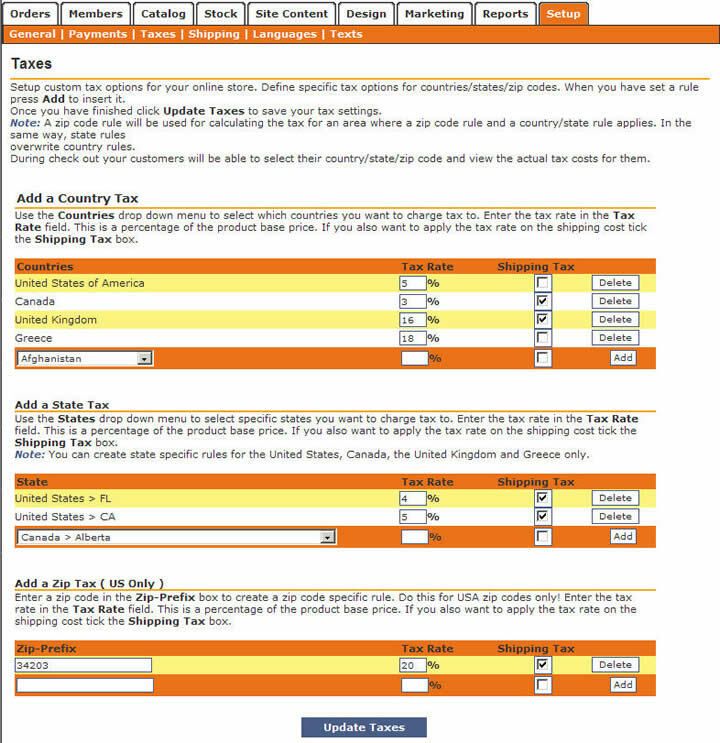 Magnet Commerce also gives you the option of adding state specific tax rules by use of the "Add a State Tax" form. Choose the state your rule applies to from the "State" drop down menu and then define the tax amount in the "Tax Rate" box. If you also wish to add tax on the shipping cost tick the "Tax Shipping" box. Once this is done click on the "Add" button to save the current rule. You can always delete a rule by using the "Delete" button. Please note that you can apply state specific rules for the following four countries: Canada, Greece, the United Kingdom and the United States. A third option is to add area specific tax rules by specifying the zip code of the area. In the "Add a Zip Tax" form, type a zip code in the "Zip Prefix" field and then define the tax amount in the "Tax Rate" box. If you also wish to add tax on the shipping cost tick the "Tax Shipping" box. Finally click on the "Add" button to save the current rule. Remember there is always the option of deleting a rule by use of the "Delete" button. Please note that this can only be implemented for shipping in the United States.
! Remember, it is important that you click the "Add" button after each rule is set or the rule will not be applied! Once all the rules have been added, click the "Update Setup" button to update the e-commerce storefront with the current settings. Lets now take a look at an e-commerce storefront for which the previous tax rules have been set. By viewing the cart in which two items have been added, we can perform a quick calculation of the tax and shipping costs and view the total price of all items. By choosing Canada in the "Country" drop down menu of the "quick tax and shipping calculation tool" and pressing the "Calculate" button we get the final cost of all items including a 3% tax on the product price and a 3% tax on the shipping cost. Please note that in the case of Canada the amount of tax applied is the same for all states since we have not defined state specific tax rules. Figure: Calculating the tax and shipping cost for Canada. Figure: Calculating the tax and shipping cost for the United States. However, if we also provide a zip code for the United States the appropriate zip (or state) tax rule fires. In our case, when providing the zip code "34203" a 20% tax is added to the product price as well as the shipping price, as explicitly defined in the "Zip Tax" rules. Figure: Calculating the tax and shipping cost for a specific area -specified by the Postal Code- in the United States . Please note that the Country and Zip code that a customer defines when using the calculation tool is not automatically added to the "Billing Details" and "Shipping Details" forms that are filled in during the "Checkout" process. And it's the information in these forms that is actually used for completing the order. The purpose of the calculation tool is only to inform the customers about the total cost of an order. Choose "Setup > Taxes" in the administration panel to set Country or State specific tax rules. To define a Country specific rule choose the desired Country from the "Country" drop down menu. To define a State specific one choose the appropriate State from the "State" drop down menu or define a Zip code in the "Zip-Prefix" field (zip code rules only apply to the United States). Define the tax added on the product price in the "Tax Rate" box. If you also wish to add tax on the shipping cost tick the "Tax Shipping" box. Finally click on the "Add" button to save the current rule. Remember, this is important as the rule will not be applied eitherwise! Once all the rules have been defined click the "Update Setup" button to update the e-commerce storefront with the current settings. There is always the option of deleting a rule by use of the "Delete" button.